December 22nd was a day of complex displays over Central-Europe. While Hungary was covered with thick fog, mountain peaks above 900m witnessed sunshine and favourable conditions for halo-formation. Attila Kovács took the photo of the suncave Parry arc on Bálvány in the Bükk Mountains 956m above sea level. The display started with bright parhelia that appeared at 12:05 UT and lasted about half an hour. At around 12:30-12:40 the complex display began to emerge. First the 22° halo with the upper tangent arc. 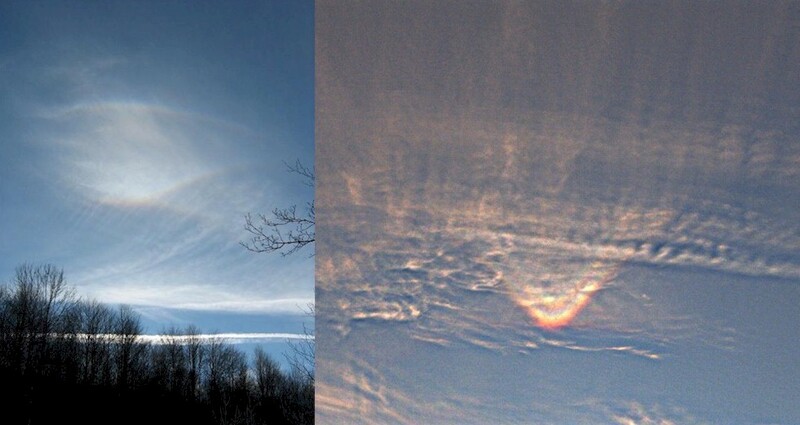 Altogether, a 22° halo, parhelia, UTA, a long section of the parhelic circle, CZA, supralateral arc and the sharp suncave Parry arc were visible. The Parry arc lasted about 5-10 minutes. There is unfortunatelly no report about the anthelic side. Although the Czech Republic is two countries away towards the northwest, the distance is not that great for crystals forming a display in high clouds, especially that the Hungarian Parry observation was made in the north of the country. On the very same day Martin Popek photographed an attractive sunvex Parry in Nýdek. That's a sharp Parry nesting inside the tangent arc in Martin's photo. In the south of the Polad I observed very bright UTA, beautiful CZA, sundogs and weak 22 halo. Now, I have no time to work on my photos, but I am planning to start my atmospheric phenomena website and this time I can give you photos. Good to hear there is halo observing in Poland as well. It is really expanding in Eastern Europe. Nice halos in high clouds! In France, winter time is not so good for halos! 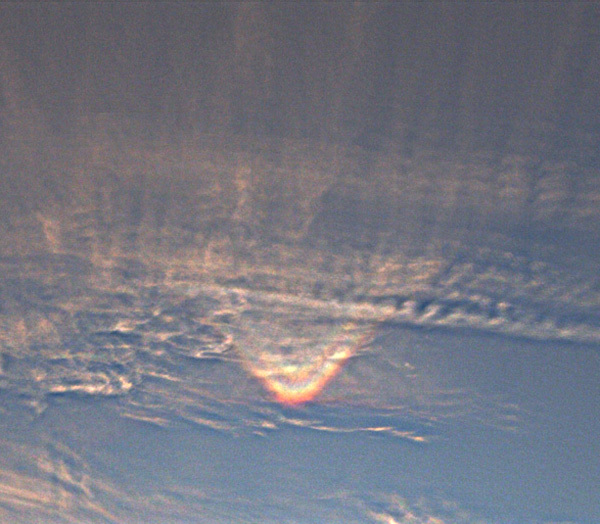 It looks like the upper Lowitz arc is visible with the suncave Parry arc; on the photo of the supralateral arc, it seems that something very faint is crossing the upper tangent arc on the right. Thanks for the comment, Cyrille. We were also looking at that arc, and I was also suspecting it to be an upper Lowitz first. However, it couldn't be decided for certain, so in the end I didn't write anything about it. That stripe might as well be only a tricky cloud pattern, but suggestions for the nature of that strange arc-like crossing are welcome.